We are located in historic Lowell, Massachusetts. 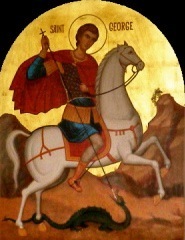 St. George is a family-oriented, congregation that celebrates the Orthodox Divine Liturgy every Sunday at 10:00 AM. Come hear what you've been missing. Non-Orthodox visitors are always welcome. Visiting children are also welcome in services and our Sunday School.